What are the lessons in YOUR life? The squirrels will not give up! It would be comical if it wasn’t so annoying! And distracting! I’m supposed to be working at the computer, but instead I’m watching their antics. We are new to the world of birds and bird feeders, just starting our second year. I think the squirrels gave us a pass in the first few months, giving us time to enjoy all the new visitors. But as time went by, these furry-tailed rodents became more insistent, and creative. Their leaps became longer, their visits more frequent. Despite the baffles and squirrel-buster techniques, I think they are here to stay. I imagine there is a lesson here for me, perhaps you more experienced “birders” have come to peace with the unwanted guests? As I look out this November morning, my heart is calmed by the mourning dove’s silhouette as she walks up the shed’s roofline. I smile at the nut hatcher who pecks for food while upside down. The tufted titmouse bounces from arm to arm of the black metal stand before setting down with some seed. All is right with the world, and then…(cue the soundtrack from “Jaws”)…instead of nicely rustling around in the leaves below, picking up the leftover seeds and shells, Squirrel remembers, “There are seeds in yonder ‘hills’!” and the ritual begins again. Squirrel doesn’t give up, and her tenacity inspires me. I suspect the rewards are few compared to her heroic efforts, but persistent determination keeps her going. Could that be the lesson for me today? 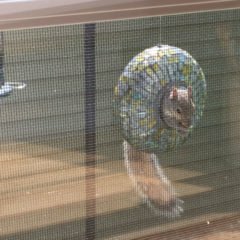 Is Squirrel teaching me to respond to the challenges in my life with purpose and renewed stamina? Right now, it’s time for me to go to my water aerobics class. When I get back, its time to work on edits for my book. Its time for me to climb up that pole, leap from that shed, and trust I will land where seeds are plentiful. It’s time to rely upon my life-giving instincts and keep going! !